As a Life Care Retirement Community, Lakeview Terrace offers Medicare Certified comprehensive Rehabilitation and Health Care Services, in the Health Care Center and in your home with Home Care. These services in the Health Care Center are provided under the direction of the Medical Director, who is the personal physician to many residents. Other health professionals assisting the Medical Director include the Health Care Center Administrator, Director of Nurses, Registered Nurses, Licensed Practical Nurses and Certified Nursing Assistants. We are a 5 Star facility with The Governors Gold Seal, 5/15/2018-5/14/2021. Each home at Lakeview Terrace is equipped with an emergency call system. This system allows residents to alert the Health Care Center staff in case of an emergency. Lakeview Terrace Home Health Services, accredited by the Community Health Accreditation Program (CHAP), are available to anyone desiring and qualifying for Medicare services. 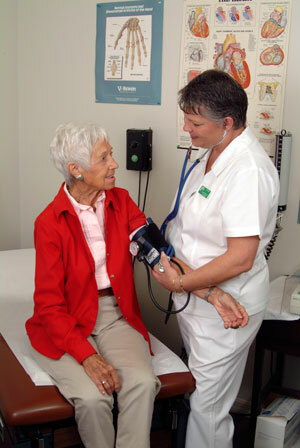 Non-Medicare home health services can also be arranged upon request. A community nurse is available 24-hours a day. She will come to your home in case of an emergency or to simply answer questions. The Medical Director holds a weekly clinic in the Health Care Center. This provides an opportunity to make an appointment to see the doctor who can answer your questions, and receive routine medical care. The Health Care Center offers levels of “in-patient” health care: assisted living apartments, semi-private and private rooms, memory care and assisted living where residents are attended by licensed nurses and certified nursing assistants 24-hours a day, 7 days a week. A Skilled Nursing Facility is also located in the Health Care Center. Brand New Skilled Nursing Rehab Center Open! How do the current residents feel about life at Lakeview Terrace?